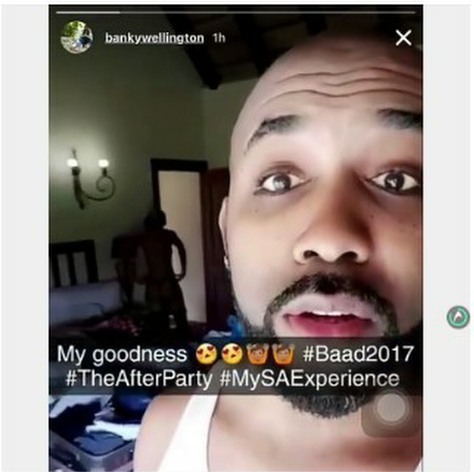 Check out the viral video that shows how Nigerian R&B singer, Banky W who got married to his actress wife, Adesua Etomi, over the weekend in Cape Town in South Africa exposed her unclad body on Snaphat while updating his fans and followers on #Baa2017 after party experience. In video trending online, the R&B singer was heard telling his fans, 'alright guys,this Zebula Lodge...South Africa. Right outside our cabin...Zebra....right outside our bedroom window', while behind him was his innocent new wife, seen unclothed, removing or trying to wear her underwear!